Does your garbage disposal smell? Garbage disposals are a welcome convenience in the kitchen, helping to get rid of organic food waste and prevent clogged drains. However, with regular use, they can develop unpleasant odors that can make your entire kitchen smell! Follow these eco-friendly tips to deodorize a garbage disposal. Lemon is a natural refresher and can get rid of many kinds of odors. If your garbage disposal smells less than fresh, run the disposal to get rid of any built-up food, and add a lemon cut into quarters to the machine. Run the disposal for at least 30 seconds to grind up the fruit and reduce unpleasant odors. If you don’t have any lemons on hand, any citrus fruit will work. Cut the fruit into small pieces to prevent clogging the garbage disposal. If you use citrus fruits regularly for cooking or eating, toss the rinds down the drain instead of in the garbage for quick deodorizing. Note: Skip the citrus if you have metal drain pipes as this can be corrosive on metal. Baking soda is another natural and effective odor eliminator. Pour a box of baking soda down the drain while running warm water to neutralize odors. If the odor is particularly stubborn, pour the baking soda down the drain and allow it to sit for several hours or overnight; then rinse with warm water. Alternatively, pour a mixture of baking soda and vinegar down the drain. Vinegar is another environmentally-friendly cleaner and deodorizer and you can deodorize your disposal and sharpen the blades using vinegar ice cubes. Another clever tip, freeze white vinegar in an ice cube tray, and once a week drop a few cubes down the drain and run the disposal until they are crushed. Ice can clear the impeller and body of the disposal of debris which will help remove the root cause of unwanted odors. 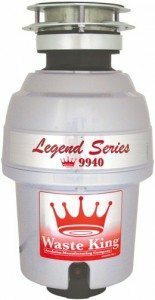 To perform a deep clean in your garbage disposal, use a specially designed garbage disposal brush, available at most home improvement or hardware stores. Using the brush with a garbage disposal cleaner or another mild detergent gently scrub the sides of the disposal to remove any dried-on debris. Clean your disposal regularly to prevent debris from causing odors. For safety, unplug the disposal or turn off the circuit breaker that controls the disposal before scrubbing. The best way to get rid of an odor is to prevent it from occurring in the first place. Each time you wash or rinse dishes, run the garbage disposal. 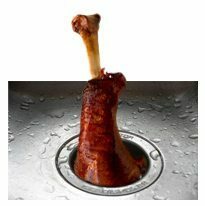 Do not allow the food debris to build up in the disposal over time as it will rot and start to smell. If your garbage disposal continues to smell even after you clean and deodorize, there may be a problem with the machine, preventing it from fully grinding and rinsing debris. If that is the case, you may want to call a professional to inspect and repair the machine. We have always had excellent service from Fox Plumbing & Heating, and Rick's service was no exception. We hadn't anticipated that we would need to the expense of replacing our garbage disposal, which was installed less than a year ago (by quartz counter installers, not Fox). Rick was very professional in explaining why it was necessary.